OOooh, Tif they are super luvverly!! Just so lovely made, nice colours you used for those lids! Little Olive on new sofa! What a lovely idea! Thanks for sharing it Dottie!. Love your crafts and creativity! this is the bestest best tutorial i have EVER seen! thank you thank you!!!!!! im so excited to try this! First...ConGrats...Second thanks for the like for the decals as I love to paint jar lids. Third hmmm gold sticky star, yes, L= loveseat and O= Olive? maybe not just a guess. Here on the east coast of FL we are happy Irene will miss us, but we are concerned about those further up the coast. Hoping you #2 will be safe. 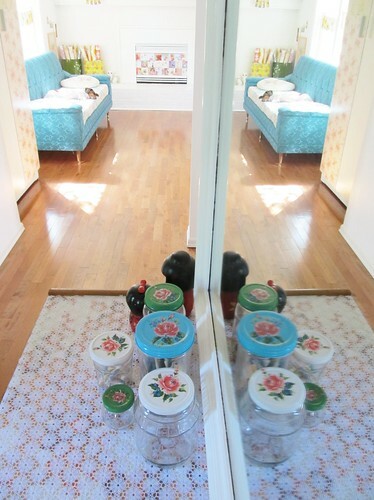 Oh, and yes, the jar lids are simply marvelous!! I do spy a Little Olive quite happily nestled on the sofa! L O , hmmm surely thats got to be Little Olive snoozing on the sofa. Did I win, did I get the gold sticky star? A gold star and a tick maybe? Loving the jar lids but far too much waiting around for me. I'm far to impatient. ha ha hee hee! yes gold sticky stars and a tick for sure! have just texted (having to learn quickly) Our #2 and she is fine and dandy. will possibly evacuate tomorrow, not sure yet... thank you for the good thoughts. You spy Little Olive, of course. i see her.....with my little eye.....and she is divine. 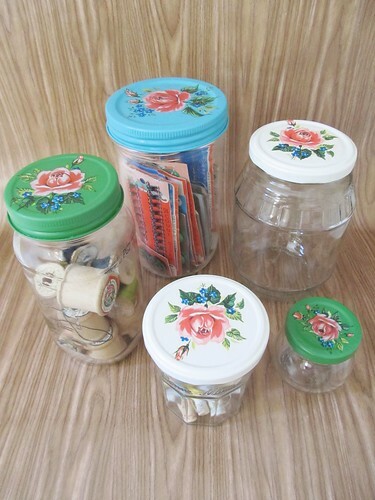 Tif, love the jar lids. I actually hand-painted my jar lids of my big vintage pickle jars that look like "kegs". With blue paint and colored flowers and green vines. I must find those in the basement somewhere. My best momma thoughts are with you on #2. I do like your way of pretty recycling of pleasingly shaped glass jars with metal lids. Trying to remember, and think that I am remiss in not congratulating on your book. I'll be on the lookout for it. Promise. Decorated jars are amazingly beautiful and add a sense of cohesiveness to their designated spot that I wouldn't have anticipated. Hope your #2 is well and safe. what lovely jars, brilliant way of recycling! Hope your #2 stays out of the way! Lovely Little Olive blending into the super duper new sofa, doesn't she look content. I have the jars, I have the lids.......... mmmm, will have to make sure the brain cell remembers to buy paint. Have a great weekend, I know you will be worrying about #2 but I'm sure she will be safe n sound, hope everyone else in Irene's path keeps safe too. They are freaking awesome! What a very cool idea, I especially love the blue one. and congratulations on the book. I loved the idea of ​​decorating the bottles. I might even attempt this - and get it donE! Oh my! 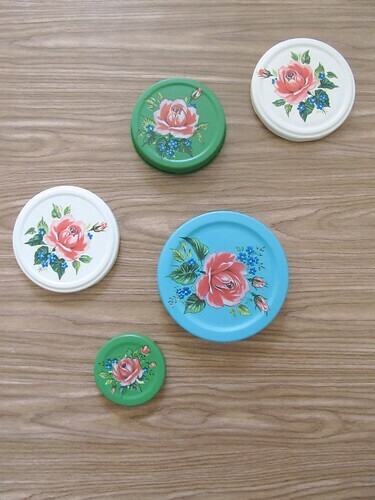 Now I need to add vintage flower decals to my thrifting list! OOh! Gorgeous. I love the colours your chose. 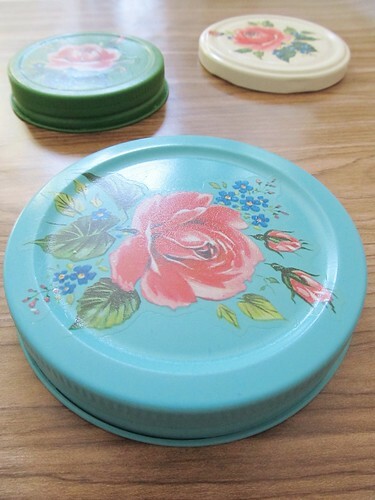 I loooooove those lids, will surely try to get some free time to paint some for myself :) Great blog!!! Your lids look fab. and I just love the way you write. Really entertaining! Greetings from Janne in Norway. How lovely to find that I am not the only person who likes jars! I have several nice ones with ugly lids that I keep them mostly for jam making but now you have given me this great idea for lids they will get used for all kinds of things! 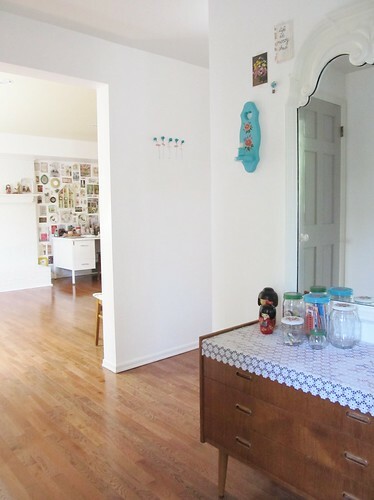 I have seen this site,decalpaper.com where you can buy all sorts but also they do a plain waterslide inkjet decal paper to print your own.The possibilities are endless,thanks for sharing! You can also use fake tattoos in the same manner. Fake tattoos also work well on duct tape.